In February 2011 Manotick Brass completed a two week tour of Cuba, playing 9 concerts in 4 cities. 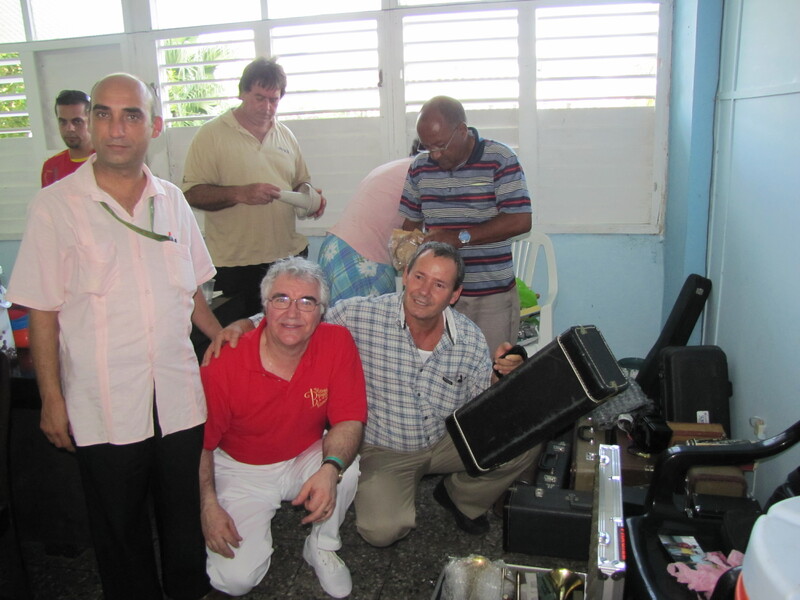 A high light of the trip was the delivery of musical instruments and supplies to a Cuban school. Upon arrival in Varadero, our group was warmly greeted at the airport by our hosts – an auspicious omen of the hospitality we would receive throughout our visit. Among those receiving us was the pastor of the Dore Valentin Presbyterian Reform Church, who had volunteered to coordinate the visit through the Cuban Council of Churches. He proved to be a true “man for all seasons” – inspiring religious leader, expert tour guide, chauffeur, gracious host and, perhaps most importantly, very good friend to the visitors. Donations of musical instruments (including trombones, trumpets, clarinets, violins, guitars, a French horn, saxophone and keyboard), musical accessories, as well as much-appreciated cash came from people throughout the area. Instruments in need of repair were looked after by MUSICARE, usually free of charge. Transportation of these gifts was a daunting task. Seven suitcases full of instruments made the journey without extra charges, thanks to the generosity of Sunwing Airline and Algonquin Travel. Performances were staged in churches of various denominations in Varadero, Matanzas, Cardenas and Havana. In Havana, we also played at a nursing home, run by the Roman Catholic Church. The audiences were treated to a repertoire of Latin and Canadian music, much of it with a gospel theme. All of the music was received enthusiastically, but in every case, the strongest emotional reaction was saved for El Mambi, a traditional Cuban melody arranged by Ottawa composer and arranger E.F. Lloyd Hiscock. A large number of the senior audience members sang along and many shed tears. Listen to El Mambi recorded live in Cuba. 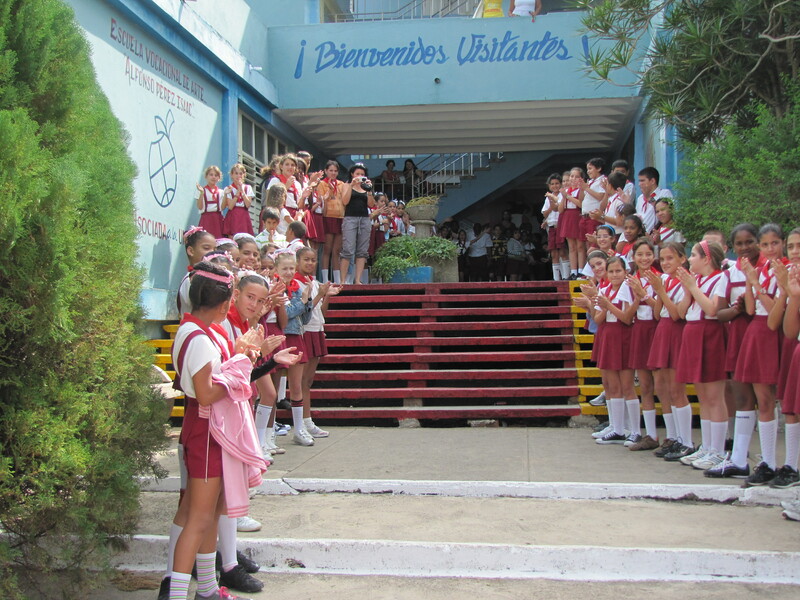 One of the main purposes of the trip was to visit the Matanzas School of the Arts. The 398 students at this school follow a regular curriculum in addition to an intensive program of either music or dance. Upon our arrival, the pupils, who were lined up along the outside steps and on the second-storey balconies, gave the visiting Canadians a reception of rock-star proportions. The joy continued during an outdoor concert featuring staff and students, including dancers and musicians. The Manotick Brass reciprocated enthusiastically with an assortment of lively music. Later, in the office of the school’s director, we realized one of the main objectives of the trip: the presentation of the instruments brought from Canada. The director was moved to say that on that day they had received more instruments than they had been given over a span 27 years. Leading up to the trip, fund-raising concerts received excellent publicity, with articles in the Manotick Messenger, EMC and the Ottawa Citizen, as well as a documentary made by a student at Algonquin College. Interviews with trumpet player Kazimier Samujlo, which aired on CBC Radio One and North Country Public Radio in Canton NY, also helped boost attendance.